While looking for bright solid scraps to use for this month’s blocks I came across a few different pink scraps plus some novelty fabric scraps so I made a donation quilt top using this month’s block. I had to put a frame around some of the novelties to bring them up to the 6.5 inch size so I guess those are framed frames. What a good use of the pattern and your stash. The recipient will love it. Wow! I know you just inspired others with a great idea for using up stash …. 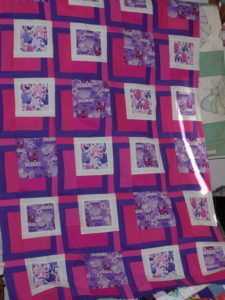 and some pink & purple-loving kid is going to love this quilt. That is a great quilt! Thanks for the extended idea!